Shrimp kabobs on the barbie(said in an Aussie accent) make a great appeitizer. 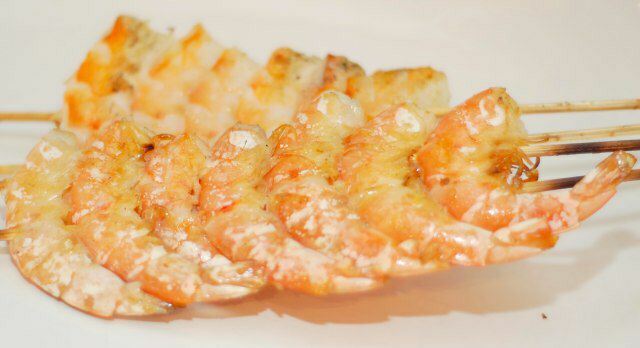 But we've heard people argue about the best way to grill the shrimp: shell on or shelled. We set out to settle this age old argument once and for all. 1There are hundreds of species of shrimp in the world, but in this recipe we used pink shrimp from the Gulf of Mexico. These have much better flavor than the farm raised shrimp. We use 26-30 count shrimp. This number describes the number of shrimp per pound, so the smaller the number, the bigger the shrimp. To save time, we buy shrimp that have already had the heads removed. 2We shelled half of the shrimp prior to skewering and grilling. The easiest way is to pull off the legs with your fingers. Then peel the shell, leaving the shell around the tail in place. De-vein if you prefer, by running a knife along the back of the shrimp and removing the vein. 1For the shrimp with shells, de-veining will open the shrimp up a bit to get some of the marinade flavor into the shrimp. Be sure to be careful not to remove the shell in the process. 2For marinade we used a simple mix of butter, garlic and lemon. You can warm the butter and garlic in the microwave until the butter starts to melt. Then stir the butter a bit and heat again until the butter is completely melted. Baste the shrimp with half the mix then wrap in plastic wrap and refrigerate for 1 hour. 3Skewer the shrimp. As in our previous Beef Shish Kabob post, we use two skewers or a double prong skewer. This keeps the shrimp from spinning when you turn them. 4With the grill fired up to high, and all the way up to temp, add the shrimp with shells directly over the flame, and the shelled shrimp just off the flame. Marinate carefully (butter dripping will flare). 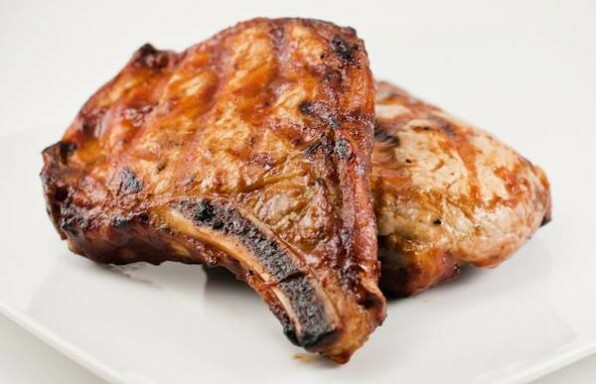 Cook for 2 to 2 1/2 minutes then turn and marinate again. Cook another 2 1/2 minutes or until the shell is pink and the shrimp are translucent. The results? Well, the shrimp with the shell on were much more tender while the shelled shrimp were a bit tougher. But the shelled shrimp had a much better flavor. Experimenting further, we found that a deeper cut when de-veining, almost a butterfly cut, but a little less than 1/2 way through the shrimp, resulted in more surface for the marinade to get in. A longer marinade time, about 2 hours, helped too. But the flavor was still less than the shelled shrimp. However, in the end, we all agreed that the tender shrimp that were cooked with their shells on were our preference. A little dip in the garlic butter, or some cocktail sauce made up for the lack of flavor.